Vineyards have been cultivated in Crete for about 4,000 years. Wine has been an integral part of Cretan culture for a very long time, as archaeological findings from the Minoan era suggest. One of the earliest wine presses was found in the area of Archanes in Heraklion, dating back to the Minoan period. During the Venetian period, Cretan wines were famous throughout the known world of the time. In fact, «Malvasia» was the most famous wine in the Middle Ages. Considered to be one of the best white varieties of Crete. It produces excellent medium body wines, with medium acidity and medium alcohol content. It has a fine aroma and a refreshing lemon-scented flavor. It is commonly used in varietal vinification. Examples of wines from this variety are: P.D.O. Sitia and Chandakas-Candia, P.G.I. Crete, P.G.I. Kissamos, and P.G.I. Heraklion, Lassithi, Rethymnon & Chania. Known as the “white diva” of Crete, it is characterized by a unique aroma with notes of apricot, high quality and a strong, creamy flavor. This variety is commonly used in the following wines: P.D.O. Chandakas - Candia and P.G.I. Crete, Heraklion, Rethymnon. One of the oldest Cretan varieties that has revived and expanded in modern viniculture. Wines produced from this variety are characterized by medium alcohol content and acidity and aromas similar to laurel (dafni). Dafni wines can impress any wine connoisseur with their unique identity, medium body and mellow taste. This variety is commonly found in wines labeled as P.G.I. Crete and P.G.I. Heraklion. A variety cultivated all around Crete, producing well-balanced wines with medium intensity and sharpness. The fruity aromas of Thrapsathiri give a special character to white wines labeled as P.DO. Sitia, P.D.O. Malvasia Sitias, P.D.O. Chandakas - Candia, P.G.I. Kissamos, P.G.I. Crete & P.G.I. Heraklion, Lassithi, Rethymnon, Chania. The variety Malvasia di Candia produces wines of high aromatic character, full of citrus aromas and strong «floral» notes. This variety is found in wines labeled as: P.G.I. Heraklion, Crete and P.D.O. Malvasia Sitias. This variety is mainly known for its distinct aroma. Wines produced from this white variety are characterized by a fine, delicate character. It is commonly found in varietal viniculture as well as in multivarietal viniculture and blends with native and international varieties in labels such as P.D.O. Malvasia Sitias, P.G.I. Heraklion, Lassithi, Rethymnon, Chania, Crete. for its rare refreshing acidity, citrus aromas and lemon notes. It gives mild and fresh varietal wines or multivarietal wines blended with richer varieties - such as vidiano. This variety is commonly found in the following wines: P.G.I. Crete, P.G.I. Heraklion and P.G.I. Lassithi. Excellent red variety, mild in flavor and full of plum aromas. It gives wines of high alcohol level, low acidity and intense aromas. It is used both in varietal and multivarietal viniculture to stabilize wine color and sooth more coarse varieties, such as Mandilaria (P.D.O. Peza, Archanes and Chandakas - Candia), and Syrah (P.G.I. Crete & P.G.I. Heraklion, Lassithi, Rethymnon, Chania). A red variety that gives extremely round, full body and soft dry wines and even more supreme rich and dense sweet wines. Liatiko wines are characterized by high alcohol levels, moderate to low acidity and notes of dried fruit, herbal and floral aromas. This variety is found in wines such as P.D.O. Sitia, Dafnes, Malvasia Sitias and P.G.I. Crete, PGI Heraklion, Lassithi, Rethymnon. One of the most notable red varieties of Crete. It is considered to be the “king” of native varieties on the island, giving wines with high acidity and characteristic bright red color. Its dominance is the result of its agility and strength, attributed to its good levels of acidity and tannins. It is commonly found in both varietal and multivarietal viticulture, often blended with the milder variety Kotsifali. Examples of this variety are P.D.O. Peza, Archanes and Dafnes, P.D.O. Sitia, PDO Malvasia Sitias, P.D.O. Chandakas – Candia, P.G.I. Crete and P.G.I. Heraklion, Lassithi, Rethymnon, Chania. It gives red wines of high alcohol content, with moderate acidity and variable color. It commonly used in both dry and sweet wines, such as P.D.O. Dafnes and P.G.I. Crete, P.G.I. Rethymnon, P.G.I. Chania, and P.G.I. Kissamos. 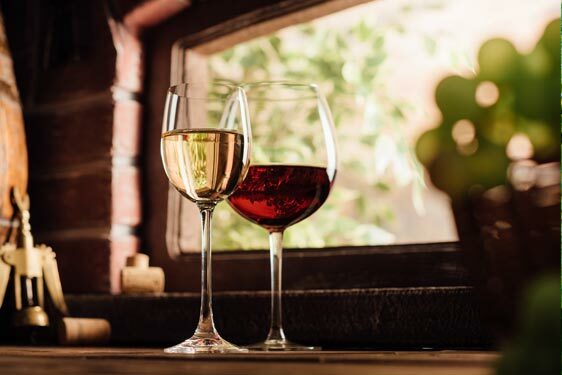 Moderate - and not excessive - consumption of red wine can have a positive impact on human health thanks to the high amount of phenolic compounds and antioxidants it contains. Studies suggest that drinking wine during meals helps prevent cardiovascular diseases. The native varieties grown in the wine-growing zones of Crete, combined with the modern methods of viticulture, guarantee the production of excellent quality wine with distinctive organoleptic characteristics, making the P.D.O. & P.G.I. wines of the island truly exceptional. The most renowned white varieties of Crete are: Vilana, Vidianos, Dafni, Thrapsathiri, Malvasia di Candia, Moschato Spinas, Piltos. Among red varieties, the most distinguished are: Kotsifali, Liatiko, Mandilaria and Romeiko.